Have you ever though on using social marketing to increase your business profits? Well, you can use Twitter to improve your business, but going back to Twitter site to change your messages would become something annoying over time. So, in order to make this task easy, AutoTweetMe was created to post this messages in your behalf. AutoTweetMe has an really simple interface, allowing you to improve your business, get in touch with your customers, make your brand top-of-mind and keep your friends up-to-date. AutoTweetMe main goal is to offer a way to make your business grow using social media such as Twitter. To use AutoTweetMe you have to make sure you have installed latest Microsoft NET Framework. Once installed, you can run AutoTweetMe to provide license information. 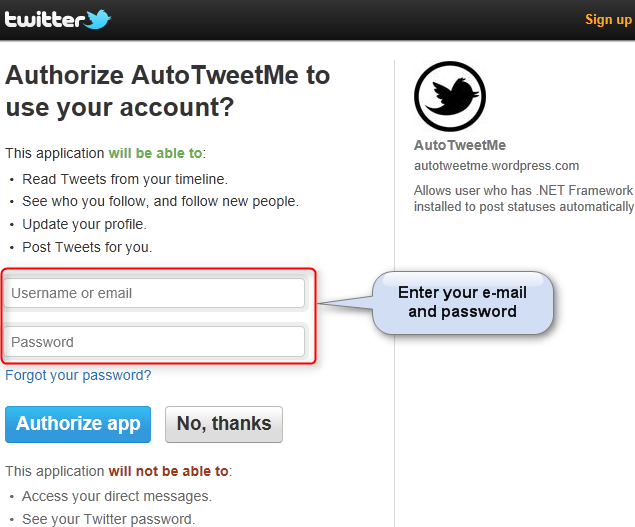 After informing your license information, AutoTweetMe will need authorizaton to send messages for you. To accomplish that, follow AutoTweetMe instructions and to visit Twitter authorization page, enter your e-mail and password, and click Authorize app. 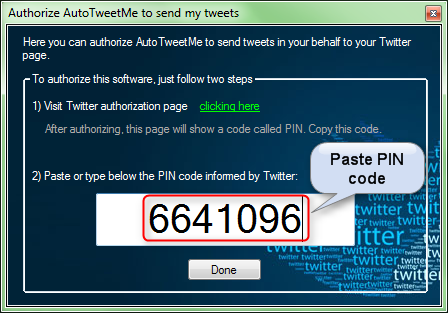 Twitter will provida a PIN key, this code will authorize AutoTweetMe. Copy that PIN code. Paste PIN Code on AutoTweetMe and click Done. 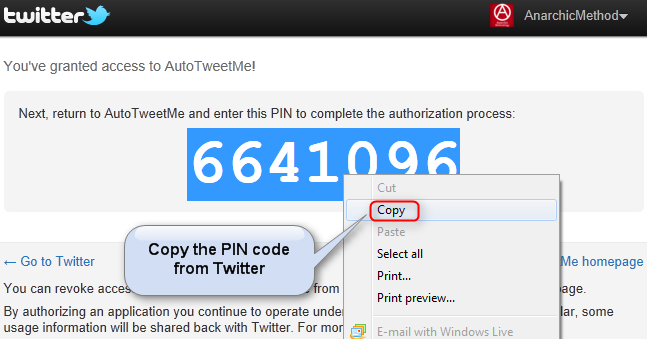 AutoTweetMe will show you if PIN Code is correct showing your twitter username (screen name). The next step is to use configuration option to set up your Twitter accounts, add desired marketing messages, and you are done. To do that, click on Configuration, on Configure your sentences, select your Account, type your message and click Save. You can run AutoTweetMe minimized on Windows taskbar, and choose its frequency for sending messages for you. It is really easy to use it and you don’t have to worry about posting messages manually again. 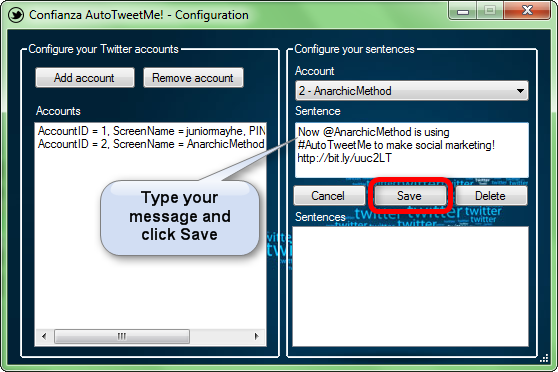 AutoTweetMe only needs Windows with NET Framework 2.0 or superior installed. 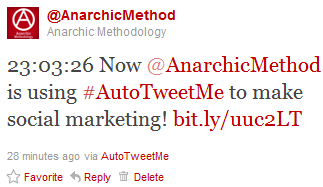 Tweet your messages automatically with AutoTweetMe and increase your profits. Improve now your business, get in touch with your customers, make your brand top-of-mind, or keep your friends up-to-date!